Operates a very unique sound system. 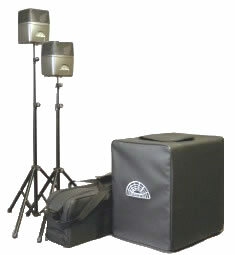 Click the links below to check out our equipment! This speaker system has a great full-bodied sound, is lightweight, and simple to set up! It is perfect for nursing homes, small to medium sized churches and other venues! and Frank Sheehan is very good to work with! 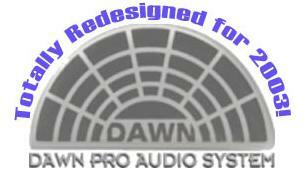 We highly recommend Dawn Speaker Systems and Frank Sheehan of American Organ Sales! Click the logos below to check out other equipment we use and dealers we recommend! And we highly recommend them! Check out their website or request a catalog! Our basic belief is that if it is good enough for God to listen to, then it ought to sound good too! Back to the Blessed Assurance Ministries home page!